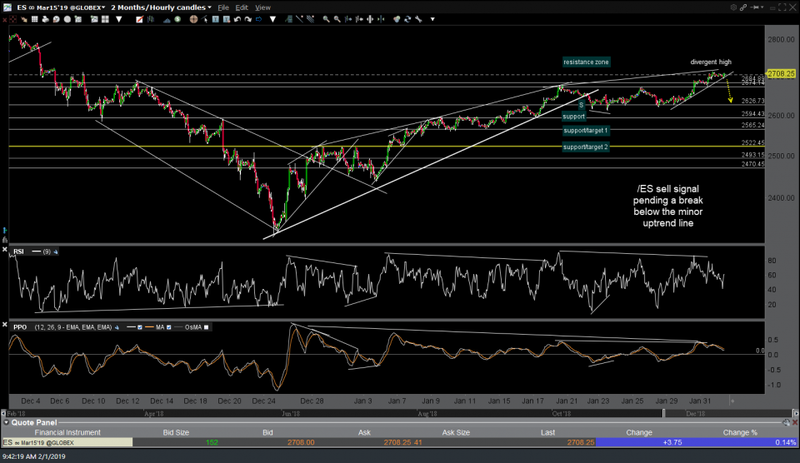 QQQ (Nasdaq 100 ETF) will offer an objective short entry on a break below today’s low of 167.24. 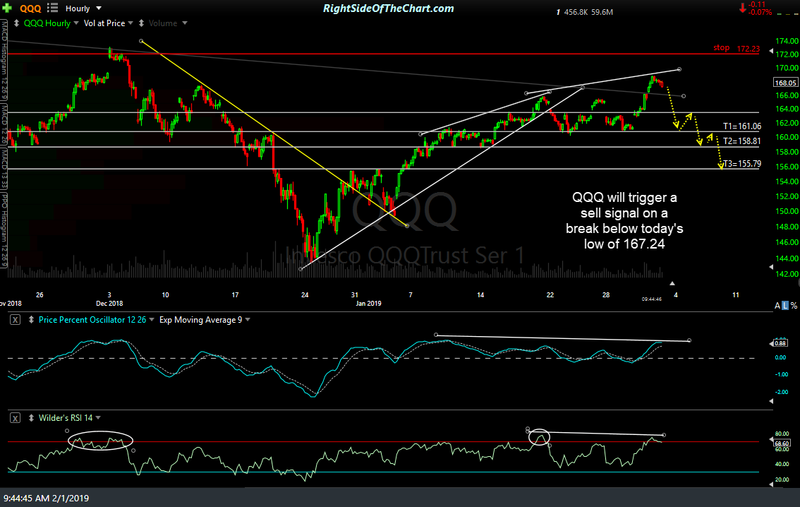 I shared my thoughts on the recent QQQ trade in yesterday’s update (click here to view) & I wouldn’t be adding this trade back if the technical case for a short on QQQ wasn’t solid at this time. Price targets for this trade will be T1 at 161.06, T2 at 158.81 & T3 at 155.79. The maximum suggested stop (for an entry around current levels) is any move above 172.23 and the suggested beta-adjust position size is 1.0. The reason for holding off for a break of the low that occured shortly after the open today is because that low coincided with tags of uptrend line support on both the /NQ (Nasdaq 100 futures) and /ES (S&P 500 futures) along with negative divergence on both at the recent highs. @rsotc thank you, what time frame would be best to use with confirming, hrly close below 167.24, or shorter tf? Thanks again. For the official trades, like this one, I like to keep the entry criteria relatively simple but as with any breakout, the odds that it will stick are increased if the breakout occurs on 1.5x or better average volume (although I find that to hold true more so with long-side/bullish breakouts than short-side/bearish breakdowns) as well as waiting for a candlestick close below the support or resistance level that triggers the breakout, in this case a 60-minute candle close below those trendlines in both /NQ & /ES. The downside to waiting for a 60-minute or in the case of trading off a daily chart, a daily close below the breakpoint for the trade, is that your entry price might be a lot less favorable if the stock or ETF starts to move impulsively after the breakout & in some cases, by the time you wait for a candlestick close above or below, you might not even have an objective entry anymore if the stock has moved too far away from the entry trigger relative to the price target. There are a lot of moving parts in trading and it is nearly impossible to list out all the variables that might come into play after a breakout is triggered so but with both /ES & /NQ bouncing off those trendlines at the same time shorting after the open of the regular session today, if/when one breaks down the other will likely follow suit. As of now, QQQ is still trading above that previous LOD & if it rallies high enough, I might revise the entry to short it at higher levels (i.e.- a better price) in anticipation of a breakdown. Thanks, Randy. I agree with this shorting opportunity. With all the recent euphoria and FOMO, the market has to pull back soon. The big money will want to lock in some gains. FYI- Short entry on a move below 167.24 has been triggered. QQQ is now an active short trade. 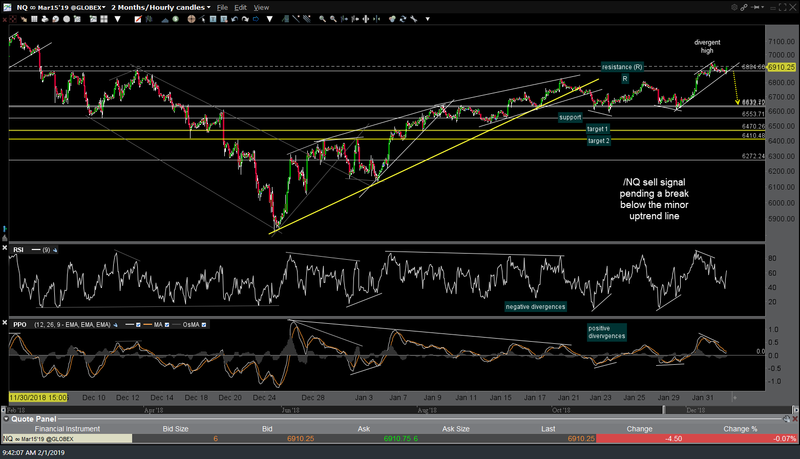 This short entry, as of the close on Friday, is certainly looking positive. The euphoric news headlines have waned, and the bobble heads are starting to talk about a pull back on the S&P. Monday shall be interesting. Alas, my QQQ short position stopped out again. I think I’m 0 for 4, trying to short the QQQ. I’m tempted to go long, but I know as soon as I do, boom!, the bottom drops out. The big money has to take profits soon, but my crystal ball hasn’t told me when that will be. Dang! Nobody bats .1000 but the key is to keep your losses small & let your winners run. Whereas as a couple of weeks ago, I was looking for a ~5% or so pullback followed by another thrust to new (2019, not 2018) highs, at this point, I am increasingly leaning towards the end of this rally off the Dec 24th lows, whenever it comes, as being THE end with the market going on to take out the Dec 24th lows. Not 100% on that scenario yet but certainly open to it. Yes, indeed. And, I’ve come to realize, sometimes it will take a couple stop-hits, before a trade idea materializes. I know this rally has to exhaust soon. There just doesn’t seem to be enough gas in the tank, to keep this market growing. Also, the S&P is hitting major resistance on the 200 DMA. I just bought another PSQ position. Earnings season is about over, and Trump didn’t say much positive, concerning trade talks. I see QQQ is floundering now.